Balcony did a good job and I would happily use the company again. It’s a cost-effective product and the ability to match the handrail colour was a factor in our choice to achieve a co-ordinated exterior appearance. We specified an RAL colour on the balcony elliptical handrail to match the ‘gunmetal grey’ shade of the property’s windows. Workmanship overall was very good and on delivery and timescales, they did what they said, when they said they would. 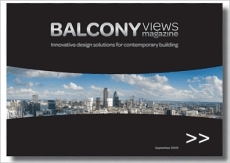 I would certainly recommend the company and would consider Balcony for any future balustrading projects. Very good, very pleased and it’s exactly what I wanted. The glass keeps views over the rock garden and distant hills. Installation by my builder was easy and straightforward. A number of people have asked me about the balcony and everyone I’ve shown it to has been very impressed, so I’d certainly recommend it. The product was delivered on time and the installation went smoothly. Anytime I needed to speak to the company, someone was there. The workmanship of the product is good and I would definitely recommend them – very good job and good product, yes definitely. I would expect Lancsville would use them again. Being glass and aluminium, the Balcony system is well-suited for its purpose, particularly for properties in coastal climates, and we’re very pleased with it. Indeed, we’re planning to use it on our next development nearby. Plus, we get an excellent service from Senator Windows, which is Balcony’s distributor in Northern Ireland. We’re delighted with the service from Balcony and the balcony itself. It arrived sooner than expected and the whole installation process went very smoothly. Balcony did everything they said they would do and the product is exactly as described. Another satisfied customer! Balcony has been an excellent company to work with. Initially the balcony was damaged beyond repair in transit by the courier. We emailed Balcony photographs of the damage and they replaced it without question, we could not fault their customer service. We fitted the balcony ourselves and are more than pleased with it. We now enjoy a beautiful view from the upstairs room. It was just what we wanted and suits our 1980s house. With a bronze handrail, the balcony looks lovely and, of course, being glass there’s no maintenance and no need to paint railings. An added benefit is protection from the wind, so we can enjoy countryside views from the south-facing balcony all year round – even in winter. A system we’d recommend. I have found Balcony both an excellent and enjoyable company to work with. The products are simple and practical to use whilst giving the clean contemporary look we were seeking to achieve. We have used the Balcony system several times. As the materials are no-maintenance glass and aluminium, it is the ideal solution for balconies on properties by the sea where corrosion is a real problem with steel ones. The Balcony system is a nice concept and a first-class system. The company provides us with an efficient and helpful service, so we have no complaints. The elegant style of the balconies suits the seaside location very well, having clear views through the glass panels and minimal post structures. “Our own installation following your instructions went very smoothly as the system is well thought out. Your assistance with drawings and checking the details of integrating to the main structure steel columns, ensured that everything fitted. Technical assistance from Balcony helped with the initial use of this system for external straight and curved balconies. The animated installation guides on CD were particularly helpful for the installers and ensured everything went smoothly. We are very pleased with the service and always receive feedback very quickly whenever we have any queries.